1. kill (someone) because of their beliefs. After it was announced that Jussie Smollett was indicted for felony charges of making a false police report, many people shared their thoughts on the situation. WE DID DURING THIS SEGMENT. 50 Cent chimed in as well - He took a different route. 50 Cent is calling out Jussie Smollett for allegedly lying about his attack. Since the skepticism around his hate crime case escalated over the past few days, it was only a matter of time. Now that the actor is reportedly facing prison time for filing a false police report, 50 (the controversial rapper) has come through with some commentary. 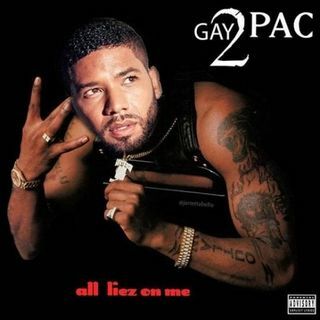 He shared an edited image of 2Pac's All Eyez On Me cover art with Smollett's face placed over 2Pac's face + plus added a reimagined moniker referring to the actor's proclamation as "the gay Tupac." The LP's title was also altered, appearing as "All Liez On Me." The montage alone clearly points to 50's perception of the recent developments in Smollett's case. He also added additional verbiage to the post's caption: "It’s 2019 people, things are a little different now," he wrote. "Commander Emanuel Gonzalez would say, if you see him shoot him on sight."